Cole’s Cafeteria, Balfour’s Tea Rooms, the Buttery at John Martins and Cox Foy’s Dining Room. Long before the fast food chains arrived in Adelaide, the main emporiums and department stores catered for their customers with a cafeteria style dining room offering the ‘fast food’ of the day. Ahhh! The memories! To a kid, on a rare shopping ‘trip to town’ with mum and grandma, it was heaven on a stick to be able to choose mains, desert, a drink and to eat something not home-made for a change. Photo from ARW. To a young child Coles Cafeteria was indeed a wondrous place. It always seemed so large, so many tables and so crowded. To a young child Coles Cafeteria was indeed a wondrous place. It always seemed so large, so many tables and so crowded. There was a plastic tray which you pushed along the shelf and in front of you the bain marie full steaming hot food, served by the matronly ladies in their her white Coles coats, always offering a large dollop of gravy, “Gravy with that love?”, “Sauce is at the end of the counter dear” and “Lovely manners sweetie”. Next would be a drink, lemonade perhaps or a milk shake and then of course sweets. I loved my banana splits or mixed sundaes but I always felt more grown up if I selected the trifle because I knew it had a little bit of sherry in it. Finally, we’d reach the cash register where mum would pay with cash while it was my job to collect the cutlery and then back to the little booth for the feast. Photo from Baytram 366 on Flickr. For many it was Balfour’s Tea Rooms in Rundle Street. In 1972 the shop was said to be the busiest in the southern hemisphere. For many it was Balfour’s Tea Rooms in Rundle Street. In 1972 the shop was said to be the busiest in the southern hemisphere. I know that people still talk about Balfour’s Tea Rooms today and tell their children and grandchildren about it. One of our posters, Janet Randell reminisced, “It was such a big deal to go into ‘town’ to shop. Always dressed up and if we were good, went to Balfours for a frog cake! Talking 1950’s here”, while Barb Jamieson wrote “We lived in Broken Hill then, and Adelaide was our annual holiday destination. We always made the trip from Semaphore to the city at least once, and Balfours was always on our agenda. Other readers chimed in with recollections, Cox Foys with the roof top funfair where you could get fairy floss after eating in the cafeteria or the old railway station cafeteria where Gail Lane used to eat often; “In the 70s I’d have an egg on toast and a pot of tea for breakfast before starting work at Adelaide Uni. It always seemed so warm and welcoming on a cold winter morning! In those days Coles variety stores had all of their products on counters with little glass petitions and ladies in the middle to serve you. Little toys, pencils, notebooks, rubbers (we were allowed to call them rubbers then), sharpeners and lollies, powder compacts, nail varnish and lipsticks. All the Embassy or Starlet brand. Every purchase was put in to a paper bag which crinkled enticingly on the bus all the way home. I believe that I had my first white coffee there with my mum when I was 16. I now work with the elderly and they have so many stories about Coles Cafeterias”. 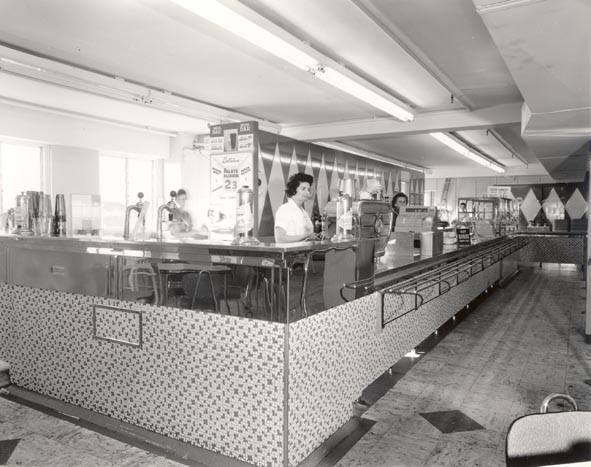 What are some of your childhood memories of those department store cafeterias? A Chookhouse, the Dunny and a Hills Hoist. I worked in John Martins buttery back in the ’70s it was a great place, christmas parties leading up to the Pagent and even being in the Pagent, I have such wonderful memorie. Fond memories of the Buttery in the 70’s. On my way home from Uni I would meet my grandfather for a cup of tea and a streudel bun served with butter. He was the Head Buyer for dress materials at Johnnies and I was training to become a Home Economics teacher. Good memories…my Mum used to take us to Cox Foys, sometimes after going to the Magic Cave. It was always an exciting trip to look forward to. Mum called cappuccino coffee “frothy coffee!”. Balfours also had Tea rooms in King William Street, just around the corner from Rundle Street. Our Wedding reception was there in October 1965.
having a pie on white plates at the train station before heading home to elizabeth ,the smells the noise of cutlery on the plates,mum and dad would have a pot of tea and i had a glass of milk,or later when dad passed mum and i would have lunch at the post office,what memories ! oh yes I remember Coles cafeteria. The school holiday outing was called “going to town”. We dressed in our best clothes including a hat and gloves and after the shopping it was lunch at Cokes Cafeteria for the 1950’s version of fast food. The desserts always looked like colourful jewels in their parfait glasses. Especially the jellied fruit, such a treat. Sometimes Mum had to walk down the end of Rundle street to pay the electricity bill so we would be taken across the road from Myers and settled in the Metro picture theatre where the ran newsreels in a continuous loop, for an hour while Mum did her messages. There was no DJ’s next to Myers in those days it was Chas Birks where you sat on a wooden chair next to the counter to conduct your business. The favourite lunch spot when we grew out of jelly desserts was of course Balfours and a frog cake after our pastie for lunch. I have lived on the Eastern Seaboard since 1965 and they can’t and won’t do pasties here. I make a passable version but always make time for a pastie whenever I go back to my home town. Hi, wondering if you have any information on I think it was called the Bohemian. It was downstairs off North Tce, dark, all White linen, I have a memory of china donkeys and carts and rubber fake grapes. This was in the 50’s. We would get the Bluebird train from the Mid North and go there for lunch before Millers &Moore’s. I seem to think it was near James Place. I remember the bars at pavement level where you could see people’s shoes outside. They did the best whiting and iced coffee! Any info? Cheers. I remember the schools’ chess competitions in the John Martin’s Buttery after-hours. Very exciting to be going into the shop when it was closed! I also remember the Quality Inn on Grenfell St, which was at basement level. It was fun to sit near the window and watch the feet of passers-by. One of my aunts wouldn’t eat anywhere else! My grandmoter liked the small cafes on each floor in the corner of David Jones – it might have been Birks in those days. I can remember catching the tram to town with her and my mother, and making a day of it, which always included lunch in one of those cafes. They each had a name and a distinct character. Does anyone remember what they were called? I remember craft activities in Myer cafeteria on Saturday mornings for children. Must have been early 60’s. Basket-weaving was my specialty and I loved receiving certificates for my work. i remember the constant clanking of the cutlery. Mum and Nanna would always have a mixed sandwich and of course a pot of tea. Pies and pasties seemed to smell and taste so much better then. And we always had to sit quietly with our very best manners on board. I too used to love going to Coles Cafeteria with my Mum in the early 70s too. It was the highlight of going in to town. Does anyone remember the soft serve ice-cream known as “Dairy Snow” which the Coles variety store used to sell in the early 1970s? That recipe was utterly the best. I wish there were somewhere today that had that exact same recipe as a soft serve.